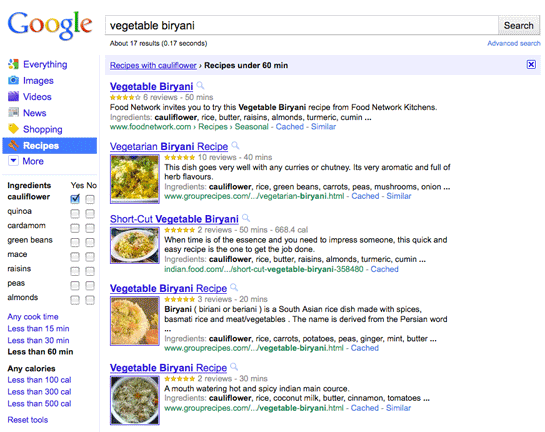 Google is adding a cool new feature to its eponymous search engine today: Recipe View, which lets you pull up results that show only recipes -- then filter them by ingredients, preparation time, and calories using options in Google's left-hand toolbar. Not every recipe on the Web will be part of the fun-site proprietors need to mark up their recipe pages with special code so that Google understands the recipe's details. (According to Wired.com, several major cooking sites already do so.) I'm getting hungry just thinking about it.